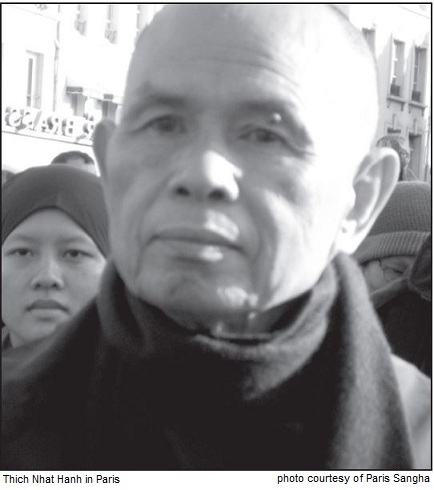 By Thich Nhat Hanh Some days the sky is completely clear, without a single cloud. When we look up, we see the blue sky – very peaceful, very powerful. The blue sky is always there for us. When it rains and storms, clouds cover the sky, but we are confident the blue sky is still there. And we are at peace, because we know that blue sky and fine weather will return after the rain. Sometimes our mind is very clear like a blue sky. We have so much happiness. We practice walking meditation with our brothers and sisters in the Sangha, and feel so happy. Our hearts are at peace and open, with a lot of space and freedom like the blue sky. We feel light and free, and we smile. We are kind to everyone. We make ourselves happy and we make others happy. If we practice mindfulness on days like that, our happiness will increase, and so will the happiness of those around us. We know how to benefit from the times when our mind is as clear as the vault of the blue sky without any clouds. That is a very important practice. But there are also times when our mind is not clear. It is not at peace, it is not free. We have worries, afflictions, and sadness in us, like the sky has clouds. We cannot see the blue sky of our minds anymore. We see only clouds in all directions. Sometimes we are not angry or in despair, but our heart is full of clouds. This is a very common state of mind—the absence of happiness. Just a little bit of anxiety, a little bit of sadness, and we don't know whether it is real anxiety or real sadness. We know that it's not happiness, but we are not sure that it's suffering. We're bored. Everything is too ordinary; nothing is clear or bright. As the poet said, "Today the flowers rise high, and I am sad. I don't know why." When a day passes with that kind of sadness and boredom, it's a terrible waste. We want to get beyond that sadness and boredom, and touch the blue sky. In the sutra, the Buddha taught us the way of changing the peg. When we have a mental formation that we don't like very much, we can change it with another mental formation, like a carpenter changing a peg that holds two planks of wood together. The carpenter hammers a new peg into the place where the rotten peg is; the rotten peg goes out. That is changing the peg. When we are bored, we can change the peg by bringing another kind of mind along, a mind that is fresher, happier. Boredom has arisen because this freshness has not yet manifested. Now, what can we do for this freshness to take the place of our sadness and boredom? An elder brother or sister can help us, or a younger brother or sister can help us. They can rescue us from our sadness. That person is as fresh and joyful as a morning bird. That person comes and takes our hand, and leads us out of our sadness, our darkness. 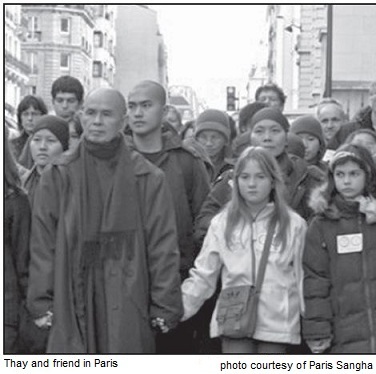 Thanks to the presence of the Sangha, thanks to a fellow practitioner, we are able to get out of this darkness. Or maybe we can do it on our own. We have the sutras, poems, practices, and short stories that can help us develop positive mental formations. In this way, we "change the peg." There is another aspect of the practice. Instead of changing the peg, we allow the feeling to stay, because our desire to change the peg immediately sometimes has a negative side to it. When we have some kind of sadness or anxiety, no happiness, we should embrace our sadness, our anxiety. Don't be in a hurry to get rid of it. We should ask, "My mental formation, are you suffering or not? Are you my enemy, my little mental formation?" Don't treat it like an enemy. Don't be in a hurry to find a way to oppress it. Embrace it and allow it to stay. "Dear mental formation, I know you are there. Now stay with me a little bit. Are you really suffering?" Our mind is like the sky. Sometimes the sky just has blueness, sometimes it has clouds. Why do we have to be so anxious? The Earth has different climates and weather, and our mind does too. The sky is changeable and people are also changeable. There is morning rain, thunder, sunshine. There are times when the sky is cloudy, times when it is dull, times when it is blue and clear. Some people have boredom or sadness from time to time. It's quite normal. We say to our boredom or our sadness, "I know you are there." It's okay. And we have to be happy, although the feeling is sadness. We accept that this is real. This sadness is real, this anxiety is real. It couldn't be anything else. So our new attitude is to embrace it, to be its friend. And then, it becomes very easy to bear. It's just anxiety or sadness, and it's not so difficult to bear. Don't think that happiness is the absence of all suffering. If we understand it like that, we have not understood happiness. We don't have to oppress or push all our suffering out of us in order to have happiness. We can have happiness if our suffering is still within us. It's like gardening. If we are good gardeners, if we garden organically, we know our garden will have flowers, and it will have garbage. If there are flowers, there is garbage. A good gardener will never burn the garbage or dump it somewhere else. They keep the garbage in order to make com­post. The garbage, the compost makes the flowers and fruits of the garden grow better. If we want to have the vegetables and the fruit, we must have the garbage. As practitioners, we know that our minds are gardens. In our minds, there are positive, pleasant mental formations, and there are negative, unpleasant mental formations. To be good gardeners, we need to have a heart of great understanding. We have to accept both the flowers and the garbage in our garden. When we see garbage, we are not angry or sad, because we know the garbage can always be transformed into flowers. We may want to push away unpleasant mental formations, to transform them as quickly as possible. But I suggest that when the sky of your mind is cloudy, you practice to give rise to a kind of caring. Return to that mental formation, make its acquain­tance. "Mental formation, are you my suffering? Are you my enemy? I know you are my friend. You have been my friend in the past, you are my friend in the present, and you will be my friend in the future. So we should learn how to live together with peace and joy, and with a non-dualistic attitude." It is not possible to have flowers without compost, without garbage. It is not possible to have happiness without sadness. Because of our suffering, we really know how to maintain our happiness. Some days, our cloudiness lasts a long time, and then, when the sun comes out, we see how wonderful it is. To accept the rainy days is very important. When it rains, we are not afflicted, we are not suffering. We accept the rain. We cannot go outside. We close the door to keep warm. We have our lunch and our tea inside. Our mind is the same. When our mind is clear, we do different things than we do when our mind is cloudy. We should not be afraid. If our mind is dull, we know how to practice. If it is clear, we know how to practice. We do not oppose any kind of mind. When we sit down with our dull mental formation with all our caring and love, we will begin to understand it, and we will say, "Cloudy mental formation, I really need you. Because of you, I have the capacity to see my beautiful mental formations. And I don't want to oppress you. You are not my enemy. I know you are necessary for the manifesta­tion and growth of positive mental formations." When we know how to take hold of our cloudy mental formations and do walking meditation with them, then quite naturally, the situation becomes easier to bear. We no longer have a desire to push it away. We just want to take its hand and look deeply at it. Then the situation will become more bearable and we can accept a day that is rainy and windy very easily. That is my practice. This practice is based on the non-dualistic way of looking at things. I asked a very young sister, "Is your mind sometimes cloudy like the sky today?" She replied, "Yes." She is still very young, but she still has cloudy days in her mind. I asked, "What do you do when you have those cloudy days in your mind? Tell me." She said she was not worried, because although she was still very young, she had the experience of those moments in the past, and they always give way to clear moments later. So they do not disturb her. She did not have to push them away, and she was not anxious about her cloudy mind. She also has the seeds of happiness. And her elder brothers and sisters have seeds of happiness and they can water her seeds. When seeds of happiness manifest, the cloudiness disappears. A famous nun in the eleventh century wrote a gatha. She said, "Birth, sickness, old age, and death are just everyday things. Why do we always pray to be liberated from them? If we spend our whole time trying to get away from birth, sickness, old age, and death, we will just be more caught in them." If we can take the hand of birth, sickness, old age, and death, it's no problem. But if we want to run away, we want to push away, we will be caught even more, because in that attitude is struggling. That is the dualistic view, and we get caught. Our method is not to have that dualistic attitude in our practice, but to find a way to look at our mental formation with the eyes of non-dualism, with love, as a friend. We must know how to invite that suffering to sit down with us, and ask, "My dear suffering, what is your nature? Are you my enemy?" We will take the hand of our suffering and do walking meditation, sitting meditation. And we know that the suffering will help us see and experience peace and joy, liberation and happiness. We have to be grateful to our suffering, because without suffering, we cannot grow up and have the capacity to accept the great joy of liberation. Therefore, the attitude of running away from, destroying, or oppressing our suffering is not an intelligent attitude. One day in waking meditation, I embraced my state of mind, and I asked, "Are you really suffer­ing?" It wasn't really suffering. It was just kind of a normal thing, like a cloud in the sky. After the rain, there will be sunshine, and after the sunshine, there will be rain. And I could see there was no need to get rid of this mental formation. "I accept you as you are. I can be happy with you." And therefore, it didn't make me suffer anymore. I could live with it very naturally, as something wonderful. "Your presence is natural. I accept you as you are." I invite you to practice this way, and you will see it is a wonderful practice. I would like to offer you an exercise. It may take weeks to do; it may take days. It's up to you. It's not the kind of homework you do with a pencil and a sheet of paper. You will have to do it with a lot of walking meditation, sitting meditation, and mindful breathing. You may like to ask for help from another brother or sister, so you can do the work in a deeper way. The focus of the exercise is a period of time you considered hard for you. This difficult time belongs to the past, but you are grounded in the present moment. You bring the past into the present moment, and consider that moment as the object of your inquiry, the object of your meditation. Practice looking deeply into it. This lesson is not the work of the intellect. The intellect can play a certain role in this exercise, but you need your heart. You need your mindfulness, concentration, and insight—body and mind united—in order to practice looking deeply and to recognize every aspect of the crisis. First, look at the event in space and time, and describe it. When did it start? How long did it last? Where did it happen? How did it happen? What triggered that difficult period? Look at the elements within you that helped trigger that difficult moment, and the elements without—around you—that helped trigger it. Did it come out of the blue? What ground served as its base for manifestation? Look deeply to recognize the roots of that affliction, of that difficult period of time. Some elements are close, and you can easily recognize them. Some elements are far away, rooted in the past, maybe in the time of your parents or ancestors. You can always ask another person to help you to identify the elements that came together and brought you to that difficult period of time. When you feel you have finished, you may tell yourself that there must be more. If you practice looking more deeply, you can identify other elements as the roots of the affliction. And you can always rely on the Sangha eyes, on your brothers and sisters in the Dharma to help you to see more clearly. How did you feel? How did you behave in terms of thought, words, action? How did you react? You acted and reacted. You need a lot of concentration. Remember how you behaved in terms of thinking, speech, and action. And again, you can ask your friend who was there, "Dear friend, how did I look at that period of time?" You have to bow to him, "Please, please, help." And he will help you see yourself. Your eyes alone may not be enough. You need the Sangha eyes to see the situation better. In Plum Village, we know that any exercise could be initiated by ourselves, but the work of looking deeply, of having deeper insight, deeper understanding, can be supported by our brothers and sisters in the Dharma. When you do this exercise, please go to the brothers and sisters who were with you during the difficult time, and ask them to help you look and reveal all aspects of the crisis, both inside and outside. You were suffering. How did you feel in your heart, in your body? Did you apply the teaching you have received in order to calm down, to get relief? Or did you just allow the suffering to overwhelm you? Did you ask for help from your brothers, from your sisters, from your teacher? Or did you just allow yourself to be seized by your suffering, and become a victim of your suffering? You have to be honest with yourself. What if, in the difficult moment, you tried walking meditation or sitting meditation, but it didn't help at all? Why didn't it help? Did you ask for help? Did you tell your big brother that you tried hard with the walking, the sitting, but did not feel relief? Did you lose your faith in the practice? Because in difficult moments, you would rely on your practice to get better, and if you did not succeed, you may tell yourself that the practice is not effective, and you lose some trust in the practice. You have to look at all these things with courage. Did you blame the other person, the person who you believe triggered Hell for you? Or did you blame the situation? You lost your confidence in the Dharma; you lost your confidence in the Sangha. Your faith in the Dharma and the Sangha became very weak, and you lost the confidence in your practice, because you did not get quick relief after some time trying. It did not happen. Did you blame the other person? Did you blame the situation? Did you blame the Sangha? And in your suffering, did you have the tendency to punish the other person, or punish the Sangha? Did you have the idea of punishing, even if you did not do anything to punish? If you believe that the other person made you suffer, it's natural that you want to make him or her suffer a little bit, so you can get relief. You may believe that punishing him or her, or the Sangha will give you a little relief. That's a natural tendency of humans. Did you have the idea of shutting off from everyone? You no longer wanted to have communication with other people. Did you have the idea of boycotting the Sangha as a form of punishment? "I don't want to talk to them anymore. I hate everyone. They are not really my brothers or sisters. They didn't know how to be compassionate and understanding." Did you want to punish by shutting yourself off from the Sangha? "I don't want to see them. I don't want to talk to them. I don't want to listen to them. I have suffered so much." Did you have the idea of running away? Just quitting? Running away is a form of punishment. "Because the Sangha is not nice to me, I run away. I don't appreci­ate you." If not the Sangha, but your partner or your family, your society or your church, it's the same. In your suffering, you might have felt that you are completely, absolutely alone. Cut off. No one in the Sangha was able to understand you. No sharing of suffering was possible. Did you intend to look for someone who can share your anger, your suffering, your fear? Because the tendency is that when you get angry with someone, you have the tendency to blame that someone for having made you suffer, and you want someone else to support your view that that person is bad, that he or she always makes us suffer. So, did you seek for an ally? Did you find someone who supported you that way, who agreed with you that the other person is impossible, the other person is always making other people suffer? Did you get relief when you found someone like that? Or were you lucky to find someone who did not support your view, but helped you practice looking more deeply, in order to understand the problem more deeply? Did anyone sit close to you and say, "Dear friend, I know that you suffer. I am here for you. I support you in the practice." And did anyone tell you that the best way to handle the situation is with compassion and understanding. Compassion and understanding are the instruments of the bodhisattva. If you apply your compassion and your understanding to the situation, you will get relief very quickly. Anything you do will come from understanding or compassion. The act of blaming isn't motivated by understanding and compassion. The act of punishing isn't motivated by understanding and compassion. Shutting off from others, running away, all these things do not seem to be motivated by understanding and compassion. What will you do if you are plunged into that situation again? Would you do the same things? Or would you behave differently? Have you learned anything from that time when you suffered so much? How did you come out of it? Did you do anything to get out, or did it just die out slowly, the difficult moment, that difficult period? Did something happen or did someone intervene so that the period of Hell ended? How did it stop—abruptly or slowly? You have to remember, because everything is imperma­nent, even your suffering. Did anyone remind you during that period of time that the suffering is going to end? It will not last forever. Did anyone remind you of that? Suffering, like any other thing, is impermanent. And we know that suffering will end some day. You have to remember that. Because during the time of suffering, we may think that it will last forever and you will not be able to survive the suffering. It's like a strong emotion, a storm. The storm always stays for some time, and any storm will stop after some time. Your suffering is the same. Did anyone remind you of that? Every time you suffer, you have to remember that suffering is impermanent. Suffering will not be there forever. Seeing this, you get relief already. "I wish that it would not stay too long. I know it will die, but I wish it would die quickly." But wishing is not the only thing you can do. You can do something in order to speed up the ending of the suffering. How did you get out of your difficult moment? Did it end by itself? Did someone help you? Did something happen to rescue you? Or did you get out of it because you had already hit the bottom? And when you hit the bottom, you begin to emerge again. This is a very important exercise. We have to do it totally, as deeply as possible, because we can learn a lot. Through the practice of looking deeply, transformation will take place. After you finish the exercise, you know that the next time you suffer will be different. You know how to go through it in a much lighter way, smiling. And you are no longer afraid. Difficult moments may come, but you know how to handle them. Bodhisattvas are not afraid, because they know how to deal with the storms, the difficulties. They know how to handle these difficulties. Bodhisattvas are not people who don't have difficulties. Bodhisattvas are those who know how to handle the difficult times. You are a student of the bodhisattvas, or you want to become a bodhisattva yourself. Therefore, you have to learn to hear with your eye, to look with your ear, to listen with your tongue, to speak with your body, to take care, because bodhisattvas are always using their eyes, their ears, their tongues, their bodies, and their minds to get through the difficult moments. When you have understanding and compassion, you only think in a way that can bring you space and relief. You will only say things that can bring more harmony and relief, and you will only do things that can bring about relief and reconciliation. And the most important thing to do is to generate more understanding and compassion. If you know how to apply them in the three levels of action—thinking, speaking, and acting—then the relief can come very quickly. Reconciliation can take place very quickly. In the future, you are likely to be plunged into a period of time like that again. If you are not prepared, you will suffer just like the last time. So look deeply at this difficult time, and prepare so that when an event like that happens again, you'll be more ready to handle it. And you have a brother or a sister who will be able to step in and help you go in the direction of understanding and compassion. When you begin to think and act and speak in terms of compassion, peace begins to settle in you and relief comes very quickly. These are the experiences of the buddhas and bodhisattvas. And those of us who have practiced know that in these moments, understanding and compassion should be generated by you and by the people who practice with you. The energy of under­standing and compassion can bring relief right away. It can shorten the period of crisis, so you begin to experience joy again. When you were in school writing a thesis or a Ph.D. dissertation, you spent one year or even two years to write on this project. But what you get is only a diploma. This exercise is very important. If you do it totally and deeply, you get liberation, you get happiness. So invest yourself into the practice. Out of our success and our insight, we can help many people around us. This is not a dissertation to be submitted to a teacher; this is a real practice. This is a gift you make to yourself, to society, and to the world. Whether you can help people, society, living beings in the future depends on the success you get in this kind of practice. So invest yourself entirely into the exercise, and if you want to share it with Thay, please don't hesitate to do so. If you want to share it with another brother or sister, please do so. This is not for a degree or a diploma, this is for your libera­tion. your happiness, and the liberation and happiness of many, many people.